Pet peeve alert! I photoshopped it to remove and change details, but this appeared in my Facebook feed this morning. 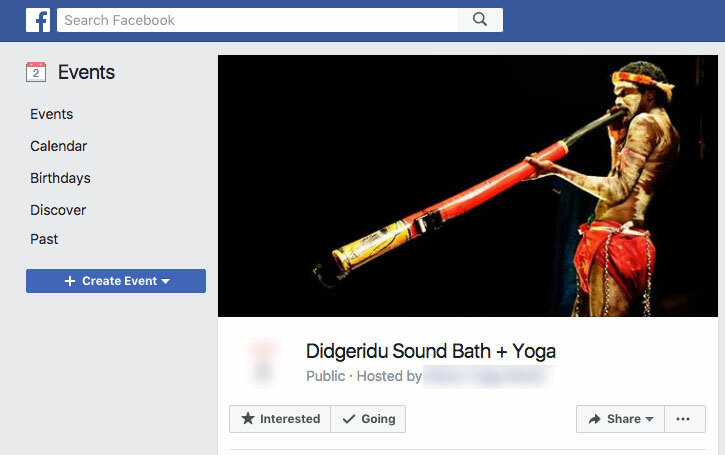 The event in the United States features a white, American didgeridoo player, but the Facebook event image shows a young Aboriginal man in ceremonial garb. Why? To imply that the presence of a didgeridoo invokes Aboriginal People or spiritual powers from their land? Does the person who selected this photo know anything about the pictured man and his culture? Does it have really anything to do with the event? 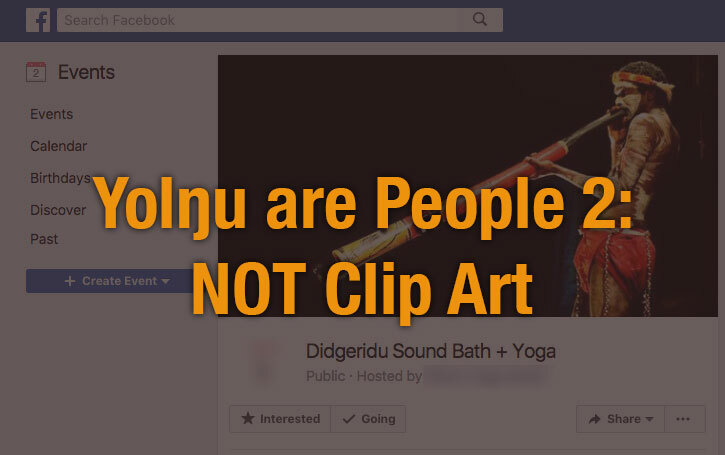 The photo was clearly chosen to feature a token Aboriginal didgeridoo player, but he is not an anonymous bit of clip art. He is a real person. His name is Ŋalkan Munuŋgurr. He is a young Djapu clan man from Yirrkala. The photo, taken by Dan McGarry, shows Ŋalkan performing with the band East Journey at the 2011 Fest Napuan in Vanuatu. I don’t know him well, but wager that he has never played for a didgeridoo sound bath and yoga class, and never will. He definitely is not playing at this upcoming event in the USA. He plays for his band and for Yolŋu ceremony. I imagine that he would not appreciate the use of his image without permission to lend some sort of mysterious authenticity to an event that has nothing to do with him or his culture. This certainly is not the first time something like this has happened and my goal is not to shame this particular promoter. I contacted the American didj player for the event. He was unaware of the use of Ŋalkan’s image and asked for it to be changed to one that represents the actual event. I know that in my youthful enthusiasm as a young, white didgeridoo player, I said and did things that I would not now. All over the world, didge players and event promoters use token Aboriginal images, art and words to suggest an authenticity or connection to Australia that doesn’t exist. Think of it this way. Do you see random token images of guitar players and drummers pulled from the internet to promote rock concerts? Or pictures of an old, white European cellist on a Yo-Yo Ma flyer to lend his concerts some authenticity? I don’t want to get too deep into a discussion of identity and cultural colonialism, but think about that for just a second. Posters for concerts in most genres feature images of the actual artists and original artwork. Posters for didgeridoo events in the USA and Europe by white artists playing instruments made by white people sometimes feature images of Aboriginal People and artwork taken from the internet. Why? And why do we feel OK using random pictures of people we don’t know from another culture when we wouldn’t do the same with people of our own culture? Yes, the didgeridoo comes from Aboriginal Australia. That does not mean that blowing into a tube on the other side of the world makes an instant connection to Aboriginal culture and gives you permission to steal Aboriginal images and concepts to promote your own activities. I’m not saying that you shouldn’t do those activities. Just own them and be yourself. Don’t use a picture of an Aboriginal Person from the internet to promote your event unless he’s going to be there! I’ll give Wukuṉ Waṉambi the last word here, in a video that appears with more discussion at http://yidakistory.com/dhawu/yidaki-issues/does-playing-the-didjeridu-connect-you-to-aboriginal-people/.